For today’s geeky Friday, we’re going to look at a couple ways to make your use of the Terminal more efficient. 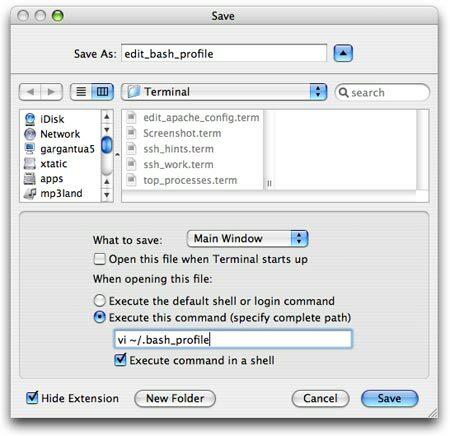 These tips should benefit anyone from the most basic Terminal user to the advanced Unix guru, and everyone between (which is clearly where I fall, though closer to the ‘basic’ end of the scale!). None of what follows is super advanced, as this tip is based on some standard Terminal features that not everyone may know about. If you use the Terminal to regularly perform some task, such as watching top to monitor system processes or using ssh to connect to another host, there are a number of ways to quicken the process. You can, of course, create an alias to make running the commands easier. But you’d still have to open a window yourself, and size/position it as you like. A much better solution is to use Terminal’s ability to create saved Terminal sessions. These sessions can have a completely customized look, and be set up to run any command you wish, and can then be activated through the Finder or from within the Terminal. Use the Display section of the panel to change the font face and/or size for your customized Terminal session. For a top command, for instance, you might be able to use a smaller font, since you don’t really need to stare at every line for any length of time. Use the Color section to change the color scheme for your customized window. For instance, if you use ssh to connect to remote hosts, it could be useful for those windows have a different color than your local windows—set host1 to have a blue background, host2 to have a red background, etc. In this way, you can easily identify your remotely-connected Terminal windows. Use the Window section to change the size of the Terminal window (or just resize it via the drag handles). A smaller window could be use for top, for instance, since its display is relatively narrow. You could also set a customized title for the saved session you’re about to create—use “Remote to Host1,” for instance, to even more easily identify your remotely connected sessions. Do not click the ‘Use settings as defaults’ button—you don’t want these tweaked settings to be standard for all new windows, just for the one window you’re modifying. As you can see, I keep a number of saved sessions ready to go for easy use—two sessions do remote connections via ssh (and have different background colors and titles), one does a top session to watch system resource consumption, one edits Apache’s configuration file, and the Screenshot file sets a nice, simple black-on-white Terminal for Macworld screenshots. So saved Terminal commands are really easy to use within the Terminal. But they can also be easily used from the Finder—just double-click any of the saved sessions, and that session will open in Terminal. You can make it even easier to do by dragging the Terminal folder onto the right side of your Dock; control-click on the folder and choose one of your saved commands from the pop-up menu.